Airfare: Surprisingly, it wasn't New York or California with the most expensive airfare - Houston, Texas topped the list with an average airfare cost of $420.57. Dallas came in second with $381.16, and Charleston, South Carolina was right behind it at $378.50. The cheapest options for lodging were Phoenix at $243, Memphis at $245, and Milwaukee at $251. However, if you're good enough friends to cram a few more guests in per room, that could help cut down on some costs! Food: New York was also the most expensive in terms of food, costing approximately $428 for 3 days of meals in the Big Apple. If you're looking to save money on food costs, Phoenix is your best bet at $277. 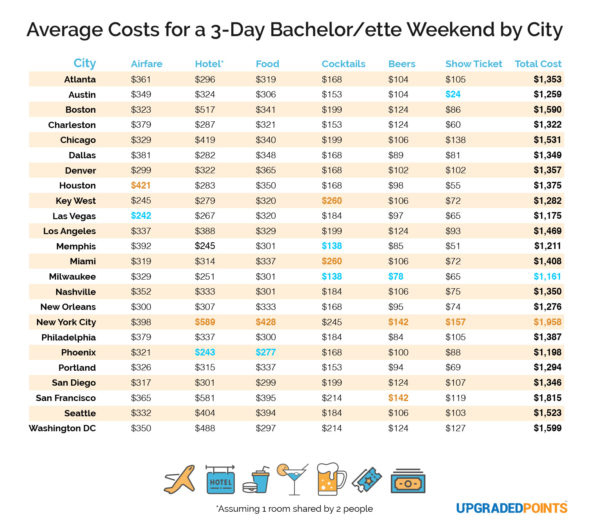 Looking at the average cost of cocktails and beers in each city, this chart can help you better determine your average cost of drinking per night (or plan for an extra budget if you think you'll go over!). 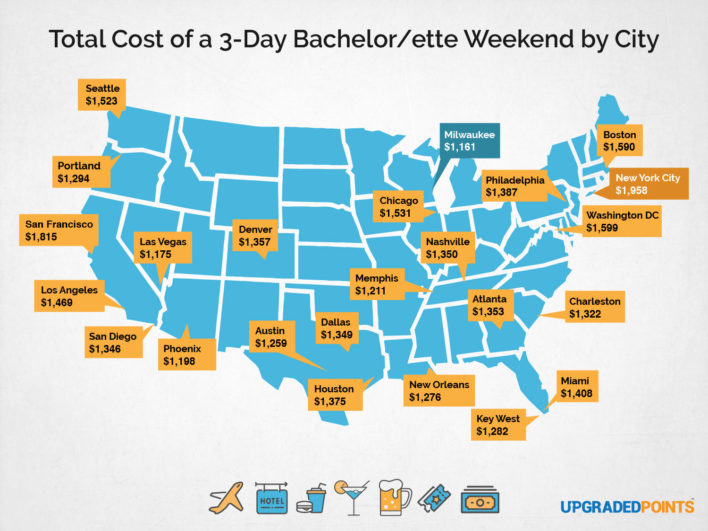 Overall, if you're looking for a fun weekend at a relatively low cost, you can try somewhere unconventional like Milwaukee or Memphis, or stick to some (keyword: hot) spots like Phoenix or Austin! For a more luxurious trip, New York City offers the finest (or at least the most expensive) food, lodging, drink, and show experiences. 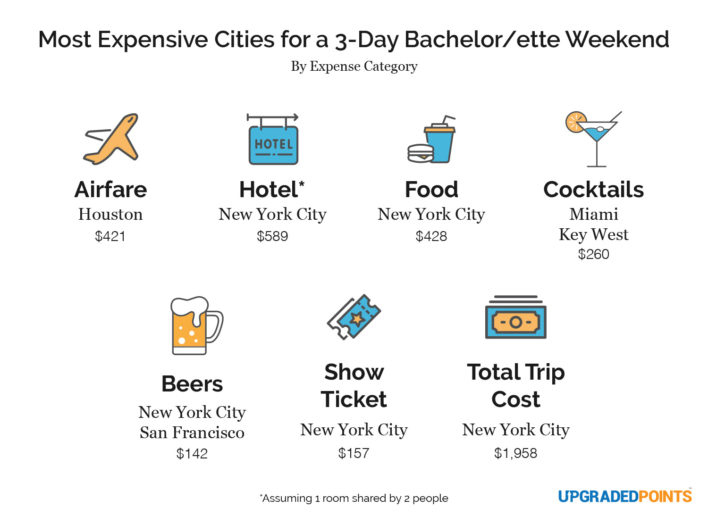 San Francisco comes in second for the most expensive weekend trip - so if New York isn't your style, but you still want to spring for an incredible trip, the Golden City is your best bet. There are many travel rewards cards that you can choose from and it's worth putting in a bit of research to compare bonus categories, perks and benefits to see which is best for you. Wherever you decide to enjoy a weekend of celebrating the end of your single days, it'll cost a few bucks '' but the memories will last forever! Just make sure to pack some ibuprofen and check what kind of rewards your credit card offers. Copyright 2018 Upgraded Pointsâ„¢, LLC. All rights reserved. From https://upgradedpoints.com. By Alex Miller.